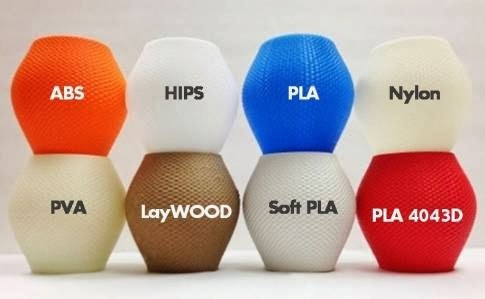 3DigiPrints Blog: What Materials use for 3D Printing ? What Materials use for 3D Printing ? 3D printing technology is adapted by many industries. Additive manufacturing or desktop fabrication is another name of 3D printing. There are different materials used in 3D printing they are nylon, PLA, wax, steel, titanium, silver, glass filled polyamide, photopolymers, tereolithography materials and polycarbonate. There are some complicated objects which can be made with 3D printing like running shoes, human tissues and organs, 3D printed car, 3D printed chocolate and many more. In the world market plastic remains the top most material used and simplest to work in 3D printing. Polylactic acid (PLA), Acrylonitrile butadiene styrene (ABS) and nylon plastics were the first types of materials used in 3D printing. With plastic, use of metal is growing in the 3D printing industry for its resistance and power. In the dental field 3D printers are used to create models for dental procedures, bridges, braces, dental aligners, prostheses and crowns. Mainly consumer products have taken the 3D printing market with products like consumer durables, toys, jewelry, fashion, automotive and aerospace using the technology. Top automotive companies like GE have announced to produce fuel nozzle through 3D printing for its high end next generation automobiles. 3D printing technology is going to see a boom in the coming years which also increase the revenue growth. United States is and will continue to remain the leading market in the world in the 3D printing technology. Followed by China where rapid gains are expected in the field of consumer products 3D manufacturing. By the year 2017 the demand for 3D printing is going to increase by 20% annually. 3Digiprints.com gives you information on 3D Printers, 3D materials, on demand 3D Printing, Proposal on 3D printing, applications used, quote for 3D printing, one can set up a demo call and information on 3D printing used in various fields. For any questions on can email on support@3digiprints.com or contact 919900003300 or 919820332555.